Starting a new business can be highly exciting, but can also be a complicated process. In order to ensure that you follow every necessary step, you should always consult with an experienced business attorney in St. Louis and St. Charles. At the Law Offices of Kenneth P. Carp, we guide entrepreneurs through every step of the start-up process and advise you on your best options. If you are considering starting a new business, please call our office at (636) 947-3600 for assistance today. Your very first step in starting a business should be to consult with an attorney with experience in business formation. Every state has different requirements for starting a business, so you should always consult with an attorney who is specifically familiar with Missouri business laws. A lawyer can go over all of your options for your business and help you make difficult decisions. Each type of business entity has advantages and disadvantages which you should carefully weigh before settling on your business form. Each type also has its own formation requirements under the law, and an attorney can make sure you are in full compliance. In addition to registering your business with the Missouri Secretary of State, you may also have to then register your business with other state agencies, including the Missouri Department of Revenue for tax purposes, the Internal Revenue Service (IRS), the Missouri Department of Labor & Industrial Relations, and more if necessary for your type of business. You also must secure any professional licenses or permits that are needed to conduct your type of business. License and permit requirements can vary widely, and a business lawyer can evaluate your situation and advise you on all necessities for you. 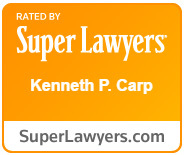 At the Law Offices of Kenneth P. Carp, we pride ourselves in providing the highest quality of assistance in helping new business owners reach their goals. We have the ability to advise you on every aspect of business formation and we offer free consultations with no obligation. If you want to start a business in the St. Louis or St. Charles area, please do not hesitate to contact our office at (636) 947-3600 today.